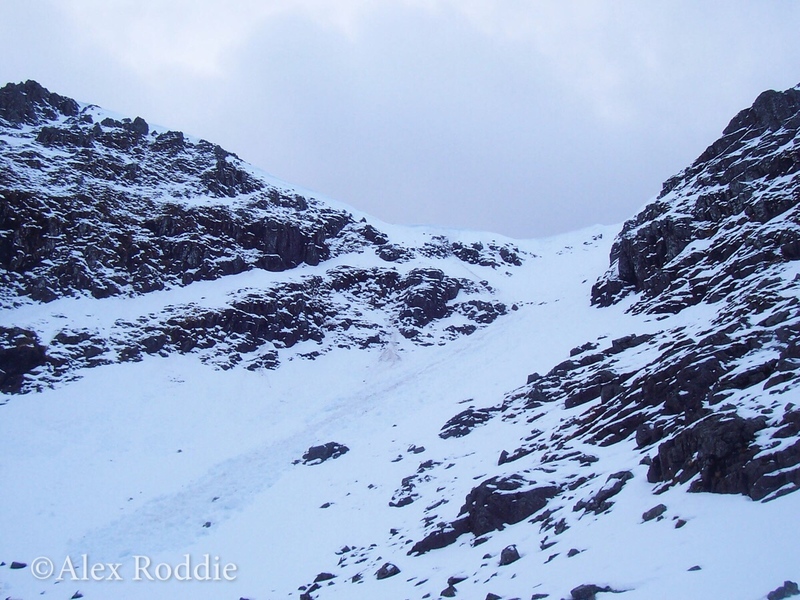 It’s my first trip to Glen Coe and I’m planning my first winter climb. Conditions are terrible, but I’m twenty years old and don’t know any better. What could possibly go wrong? I arrived at the Red Squirrel campsite late last night in the pouring rain. My knowledge of the area is pretty shaky, but I had assumed that Glencoe village would be in Glen Coe itself – turns out I’m completely wrong, and it’s actually several miles down the road. The bus dropped me off outside what looked like a ruined hotel with drizzle flaring in the glow of a street lamp. After consulting my map, I realised I had a couple of miles to walk back along the road to the campsite. There’s a pub marked nearby too. The walk along the road was miserable. I’ve brought far too much kit with me. The big duffle bag must weigh twenty kilos, and although it has shoulder straps it’s the least comfortable thing you can imagine to carry on your back. Rainwater dripped through the trees and sluiced into potholes in the road. A car drove past and nearly wiped me out, driven by a maniac along single-track road in the dark. My head torch battery was almost dead by the time I reached the campsite, and I had to pitch my tent in a feeble glow. Once I got into the tent I realised that all my stuff was soaked. It’s an inner-pitch-first tent – and the inner got saturated in the time it took to put the shelter up. Combine that with a sleeping bag not really warm enough for the conditions and you have the makings of an uncomfortable night. This morning, after I open my bleary eyes, I realise that I’ve put my tent up in a dip that has collected rainwater. Some of the things I left in my tent porch are floating; some are submerged. There are damp patches on the inside of my groundsheet (which has never been that waterproof). The Lost Valley was a longer and harder walk than I anticipated. Looking at the map, based on my experience in the Lake District, I’d planned for about two to three hours to walk from the campsite to the head of the Lost Valley. In actual fact, it took me more like six hours, and now it’s after one o’clock in the afternoon. I’m standing at the base of a huge avalanche slide that has come down from the cliffs above. It’s a slurry of melting snow and huge blocks of ice, mixed up with rock fragments and bits of pulverised vegetation. Looking up, I can see the gully it came out of: a hideous-looking couloir, much steeper than I expected a Grade I would be. But as I poke at the snow with my ice axe, I tell myself this avalanche cone is probably days old; the blocks are smoothed over by melting, and it just doesn’t look that recent. Just to be sure, I dig an avalanche test pit. This is something I have practised before. 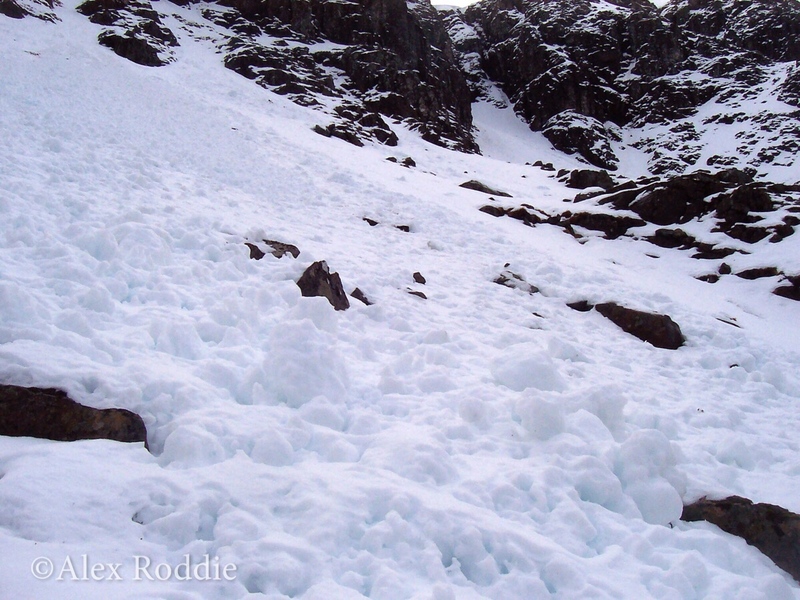 A year ago, on my first trip to Scotland, I learned about avalanche awareness and moving safely with ice axe and crampons on steep ground. I remember how the instructor told us to get our hands in the snow, poke at the layers, see if anything moves. I dig down and down but don’t find a firm layer. Everything’s just mush, and when I tug at the back of the block I’ve tried to isolate, the whole thing just collapses. This is probably fine, I reason. There are no real weak layers. I mean, it isn’t very well consolidated, but I don’t think the avalanche risk is that high. The real reason for my confidence? I’ve saved up to afford this trip to Scotland, and I won’t have another opportunity for almost a year. I don’t want to come away empty handed. As ravens soar overhead and I try to ignore the rapidly advancing hour hand on my watch, I select my route of ascent at the head of the Lost Valley. It’s an indefinite buttress of rock at the left-hand edge of Lost Valley Buttress. After consulting my climbing guidebook I’m pretty sure it’s an unrecorded route. This lends a pioneering feel to the outing; I have no way of knowing what may lie ahead of me. The snow is soft, very soft. My crampons have nothing to bite and I find snow balling up under them with almost every footstep. 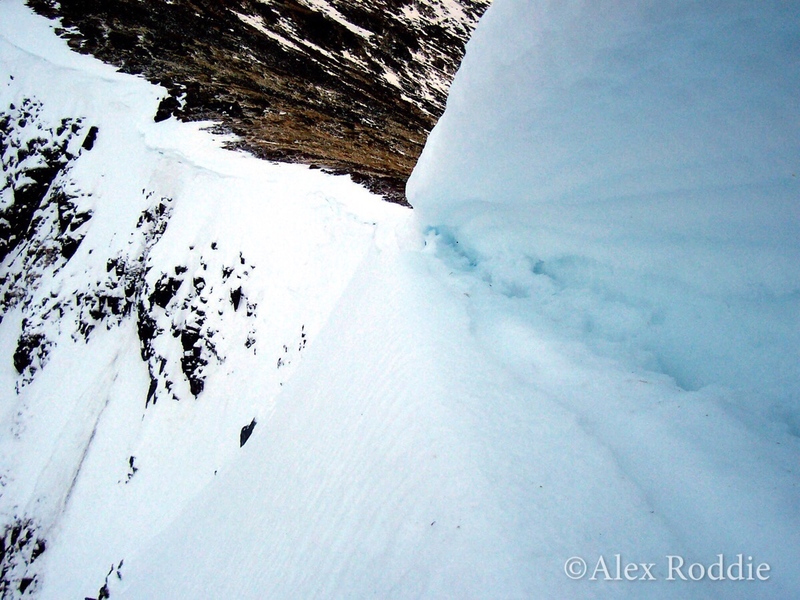 The shafts of my ice axes sink down until the spikes hit rock. The angle isn’t too steep at first, maybe 30˚, and I stagger and wade upwards, weaving back and forth between easy rock bands. Above me I see steeper ground and blacker cliffs. Despite my inexperience, it’s pretty obvious by this point that there’s a serious thaw on. Water trickles down the rocks. I feel uncomfortably warm in my thick Dachstein mitts, and every now and again I hear snow tumble down the slopes on either side of my climb. They aren’t full-blown avalanches, but these small slides are enough to make me nervous. I’m safe on a buttress route, I tell myself. The climbing gets harder as the route steepens. To be honest, I’m glad to stop wading through soft snow and get onto the rock, but it isn’t exactly classical mixed climbing – the rock is mostly bare, and although I can search for holds with my hands I end up teetering on the front points of my crampons, balancing on delicate slabs and pulling around overhangs. The thought crosses my mind that I’d be better off removing crampons and just climbing in boots, but what kind of a winter climb would it be then? The final slope beneath the cornice is absolutely brutal. I just didn’t see it coming. One minute I’m scrambling on chossy rock, the next I’m standing on thawing, 45˚ snow that just seems to get steeper until it ends in a nasty undercut cornice at the top. The cornice doesn’t look that big, but I’ve never climbed through a cornice before. I’m alone, and unroped. As I look back down the route I’ve climbed, into the gulf of space that is the Lost Valley, I suddenly feel paralysed by exposure. Somehow it hadn’t felt like climbing before, because I hadn’t felt that sense of being in a truly committing location; now I do, and it grips me like a claw of ice around my brain stem. I can’t go down. The climbing was never that difficult, but I’m not confident enough to down-climb it, especially with dusk less than an hour away. It’s up or nothing. My first moves upward trigger the release of plate-like layers of snow lurking at the surface. They’re brittle, but not like ice – more like expanded polystyrene. The windslab breaks away past my knees and skitters down the rocks beneath me. Here there is genuine avalanche hazard. Here I have to climb a slope that genuinely could go, and take me with it. Poor decisions may have led me here, but now my crampons are biting, I’m hacking up a steep slope with my ice axes, and I’m committed. It is my first true moment as a winter climber. The slope feels desperate, but I claw my way up, trying not to dislodge too much of the windslab layer. Beneath it, the snow is sugary and barely supports my weight, so it’s still a wading game. Before I know it I’m hard up against the underside of the cornice. It’s barely as high as I am, and overhangs maybe a couple of feet from the edge. Water drips from the layers of snow at its surface. It’s clearly been damaged by the thaw. For a moment, ensconced in that cosy space between exposed wall and the ridge above, I just marvel at the patterns and whirls in the snow. It’s beautiful. Then I hack my way through. Snow falls between my legs and disappears into oblivion below. 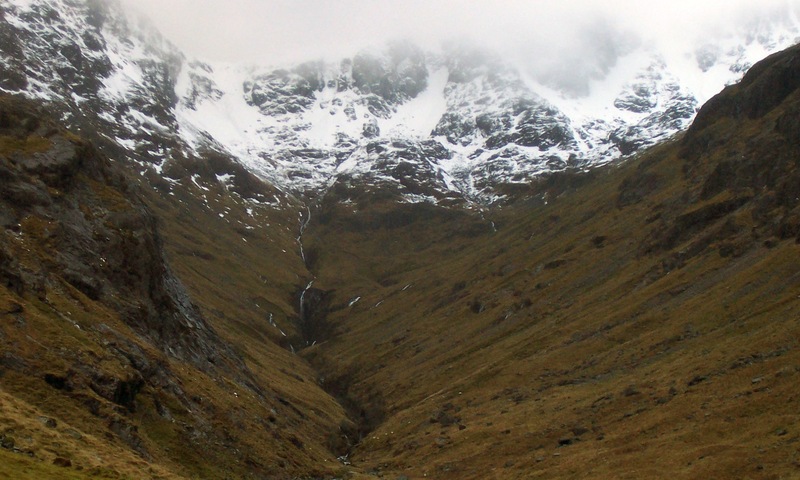 Soon I’m standing near the bealach between Bidean nam Bian and Stob Coire Sgreamhach. I have completed my first winter climb. 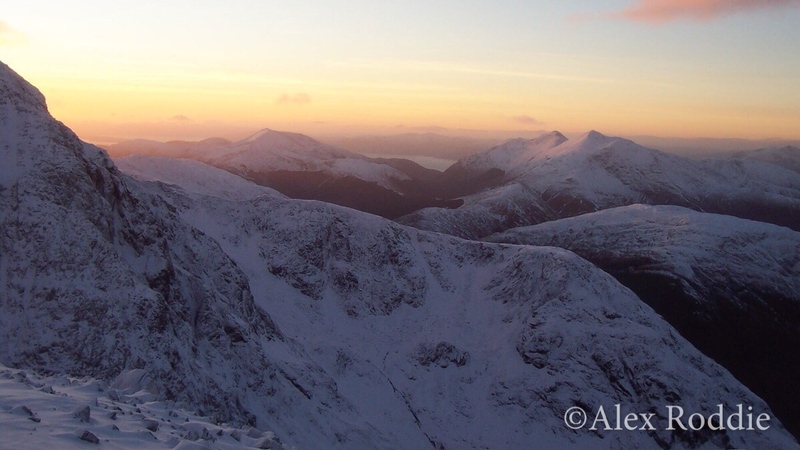 The sun is setting over Loch Etive – there’s no way I’ll have time to summit Bidean now – but my body is shaking with a potent cocktail of elation, physical exhaustion and dissipating stress. Have I truly made a first winter ascent? Probably not – and it was a scrappy route anyway, hardly worth recording. But it was a first winter ascent for me, and I knew that my life will never be the same again. Now I just have to get down. With darkness coming on fast, an avalanche-prone descent gully, dead torch batteries and an unknown descent through the Lost Valley, I have a feeling it will be a while before I’ll be back in the comfort of my tent. It’s well past nine o’clock at night by the time I trudge the final mile back along the road to the Red Squirrel campsite. I’m worn out and take a moment to sit on a rock by the side of the road, squinting at the lights of a building nearby. I see a sign hanging on the other side of the road. It says ‘CLACHAIG INN’. Maybe a pint before bed is what I need to drive the exhaustion out of my muscles. When I find my way round to the public bar, I find the place deserted. It’s a huge room, fit for a gathering of hundreds, and everything seems to be made of varnished wood: the tables, the chairs, the faux beer barrels propping up the bar, even the tree trunks that have been built in to the structure of the building. There’s a feeble fire glowing in the stove, but it’s chilly in here and feels unwelcoming. I see a row of ale pumps. Only a couple have pump clips attached. Behind the bar, standing in front of a dazzling shelf of whisky bottles, I see a man with a big bushy beard scowling at me. He pours me a pint of something called Eighty Shilling. I learn that the barman is called Jimmy. Apparently he’s something of a celebrity in these parts. ‘Yes,’ I say as I hurry to drink my pint, well aware that Jimmy is doing me a favour keeping the bar open.